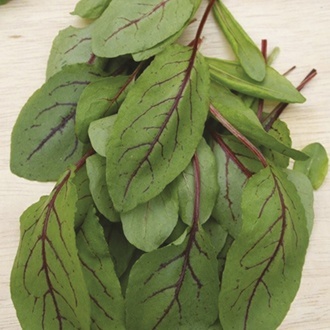 Sorrel is a perennial herb that is often eaten young as a baby salad leaf, it has a sharp, citrusy zing and is traditionally used to flavour soups and sauces. ‘Red Veined’ is a particularly attractive variety, with acid green leaves and deep burgundy veins which look fantastic in a salad. Low growing (up to 12cm/5in tall) it’s suited to pots or mixed patio containers.